Over the last several years, since the first round of load-shedding in early 2008, the subject of electricity supply and cost in South Africa has become very controversial. 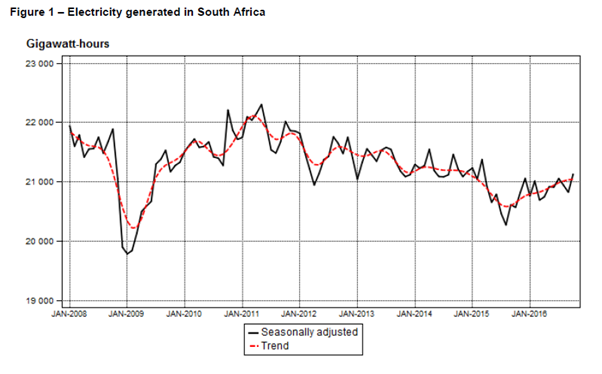 Despite recent claims by Eskom that due to good management and maintenance of plants they have “solved” the re-occurrence of load-shedding, the reality is the economic slowdown provided them with relief to supply less electricity as detailed in the graph below. (Source: Department of Statistics, Oct 2016). The total combined renewable energy projects which have come on stream have also assisted greatly in shifting load off conventional power stations. 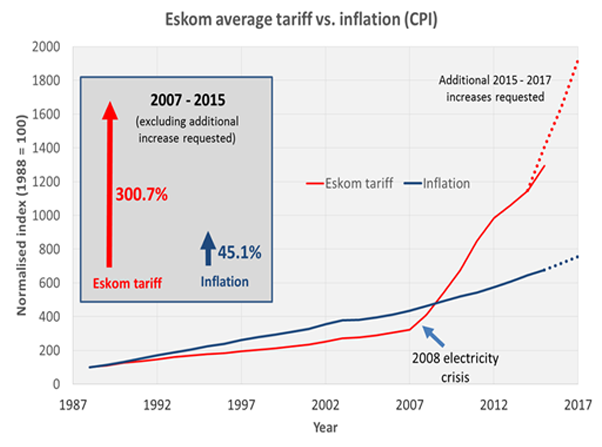 The electricity crisis is here to stay for many, many years to come and Eskom will continue to press for hyperinflationary increases to keep it from going bankrupt and to finance new projects. Over the period 2007 to 2015, Electricity prices increased on average by over 5300% compounded, compared to a compounded inflation rate of 45%. In other words, an electricity bill of R700 per month back in 2007 has increased to more than R2000 per month today. The announcement that Eskom wants South African homes and businesses to pay 20% more for electricity from 1 April 2018 is just the tip of the proverbial iceberg. With the ruling by the Supreme Court of Appeal on 6 June, the door has been flung open for the approval of further electricity tariff increases over and above the proposed 20% tariff hike as Nersa will now be able to process regulatory clearing account (RCA) applications by Eskom to recover about R42billion through further tariff increases. Energy expert Chris Yelland has warned that the judgement has dire implications for the cost of electricity. Our considered view is that the Eskom will propose for massive increases of up to 50%, aiming as high as possible so that any compromise tariff is likely to be in the region of 20% or more, and will be so every year for the foreseeable future. Given the poor state of the Eskom fleet, the high cost of the new power stations which are slowly coming on stream and the possibility of an ambitious but ill-conceived nuclear build programme which the country cannot possibly afford, it is very likely that for the foreseeable future, South Africans will be footing the bill for Eskom’s inefficiencies. SO HOW MUCH CAN YOU EXPECT TO SPEND? In less than 4 years, your current electricity costs will more than double! Consider what this will mean for your living costs, and what will be eating the bulk of your retirement savings down the line! 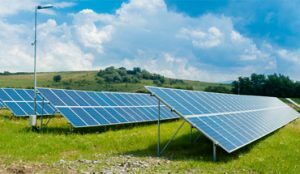 On a current bill of R2000, the money spent in 5 years on grid electricity could put your child through private schooling or fully cover the cost of a three-year degree at a top university with considerable spare change. For those who get it right and invest in solar and PV with the right renewable energy provider, the savings and results are radical. Getting off the grid has never been more within your reach, or more important than now.